The Laws of the Land? In response to my latest article, a comment was posted by "Jack Shattuck" (probably a shill, but whatever) on OpEd News. Naturally, I replied. Posted below is first his comment, followed by my own response. Enjoy. The San Remo Resolution of April 25, 1920, the Mandate for Palestine conferred on Britain by the Principal Allied Powers and confirmed by the League of Nations unanimously on July 24, 1922, the Franco-British Boundary Convention of December 23, 1920, and the Anglo-American Convention of December 3, 1924 respecting the Mandate for Palestine all authorized the entire area of Palestine as ripe for settlement as the Jewish National Home. The Mandate for Palestine was subsequently incorporated as still binding under Article 80 of the UN Charter. The San Remo Resolution on Palestine became Article 95 of the Treaty of Sevres which was intended to end the war with Turkey, but though this treaty was never ratified by the Turkish National Government of Kemal Ataturk, the Resolution retained its validity as an independent act of international law when it was inserted into the Preamble of the Mandate for Palestine and confirmed by 52 states. The phrase “in Palestine”, another expression found in the Balfour Declaration that generated much controversy, referred to the whole country, including both Cisjordan and Transjordan (today's state of Jordan). It was absurd to imagine that this phrase could be used to indicate that only a part of Palestine was reserved for the future Jewish National Home, since both were created simultaneously and used interchangeably, with the term “Palestine” pointing out the geographical location of the future independent Jewish state. Had “Palestine” meant a partitioned country with certain areas of it set aside for Jews and others for Arabs, that intention would have been stated explicitly at the time the Balfour Declaration was drafted and approved and later adopted by the Principal Allied Powers. No such allusion was ever made in the prolonged discussions that took place in fashioning the Declaration and ensuring it international approval. The decisive moment of change came on May 14, 1948 when the representatives of the Jewish people in Palestine and of the Zionist Organization proclaimed the independence of a Jewish state whose military forces held only a small portion of the territory originally allocated for the Jewish National Home. The rest of the country was in the illegal possession of neighboring Arab states who had no sovereign rights over the areas they illegally occupied, that were historically a part of Palestine and the Land of Israel and were not meant for Arab independence or the creation of another Arab state. It is for this reason that Israel, which inherited the sovereign rights of the Jewish people over Palestine, has the legal right to keep all the lands it liberated in the Six Day War that were either included in the Jewish National Home during the time of the Mandate or formed integral parts of the Land of Israel that were illegally detached from the Jewish National Home when the boundaries of Palestine were fixed in 1920 and 1923. For the same reason, Israel cannot be accused by anyone of “occupying” lands under international law that were clearly part of the Jewish National Home or the Land of Israel. Thus the whole debate today that centers on the question of whether Israel must return “occupied territories” to their alleged Arab owners in order to obtain peace is one of the greatest falsehoods of international law and diplomacy. In the Anglo-American Convention of 1924, the United States recognized all the rights granted to the Jewish people under the Mandate, in particular the right of Jewish settlement anywhere in Palestine or the Land of Israel. The 1924 Convention was ratified by the US Senate and proclaimed by President Calvin Coolidge on December 5, 1925. This convention has terminated, but not the rights granted under it to the Jewish people. That above authentic international law has been replaced by an ersatz international law composed of illegal UN Resolutions. The Fourth Geneva Convention of 1949 and the Hague Regulations of 1907 are acts of genuine international law, but they have no direct application or relevance to the legal status of Judea, Samaria and Gaza which are integral territories of the Jewish National Home and the Land of Israel under the sovereignty of the State of Israel. These acts would apply only to the Arab occupation of Jewish territories, as occurred between 1948 and 1967, and not to the case of Israeli rule over the Jewish homeland. The hoax of the Palestinian people and their alleged rights to the Land of Israel as well as the farce that results from citing pseudo-international law to support their fabricated case must be exposed and brought to an end. It's lovely to find supporters of colonialism are alive and well and posting comments on OpEd News. Whereas I could go point by point and dissect your bizarre "legal" justifications for the dispossession, displacement, and disenfranchisement of the Palestinian people, I'm not going to waste my time. What I will say, however, is that your legal justifications are based solely on the premise that European colonialism and mandate control in the Near and Middle East was legal, valid, and altogether a-okay. You reference declarations, conventions, and resolutions made by one group of people (European and American colonists and imperialists) on behalf of another group of people (Zionist Jews of Europe) to deny an indigenous third group of people (Palestinian Arabs) of their rights to self-determination and sovereignty. Your arcane political proclivities are far better suited for a century ago, in the company of such notable disciplines as eugenics and racial hygiene theory. My sincere condolences about time-travel not yet being possible. You seem to argue that the European sectioning of foreign lands is somehow justified and legal - that native land can be given away with the flick of a quill in the British Parliament. You fail to mention anything about The Great Game, or even the secret Sykes-Picot Agreement of 1916, which effectively sought to slice up Arab land according to colonial whim and power sharing among European powers, namely Britain and France. Even by your inane standards of international law (which seem to be about as complex as holding a piece of paper signed by some white guy and shrugging your shoulders), the Sykes-Picot Agreement would be of vital importance. Documents from the British National Archives, later declassified, reveal certain intentions which you leave unmentioned. For example, it becomes clear that promises of Arab independence were made to Hussein bin Ali (Sharif of Mecca) with regards to Palestine, in particular, by British officials such as Lord Kitchener among others. For instance, the minutes of a December 5, 1918 Cabinet Eastern Committee meeting clearly discuss the issue of Palestine. In attendance at the meeting were Foreign Secretary Lord Curzon (chair), General Jan Smuts, Lord Robert Cecil, T. E. Lawrence, General Sir Henry Wilson, Chief of the Imperial General Staff, and representatives of the Foreign Office, the India Office, the Admiralty, the Wax Office, the Treasury, and your beloved Lord Balfour. "The whole of Palestine...lies within the limits which His Majesty's Government have pledged themselves to Sherif Husain [sic] that they will recognize and uphold the independence of the Arabs." What you fail to mention in your dubious catalogue of decontextualized European and American accords of the early 20th Century is that, at the time of the Balfour Declaration – which is seen as some sort of legal victory and precedent for the legitimacy of Zionism by Israel apologists – the British government had absolutely no jurisdiction over the region in question. There was no Mandate, no international treaty or law granting the administrative auspices of Palestine to a member of the British government. The Balfour Declaration was not a binding agreement of any kind – it was merely a letter drafted by Lord Alfred Milner, sent to Lord Rothschild, expressing Balfour's pro-Zionist intentions at the bidding of future Israeli president Chaim Weizmann. On its own, it has no place in international law. Not only this, but it directly contradicts (and does not take precedence over) the Anglo-French Declaration of November 1918, which pledged Great Britain's and France's commitment to "the complete and final liberation of the peoples who have for so long been oppressed" under the Ottoman rule and assistance in "the setting up of national governments and administrations deriving their authority from the free exercise of the initiative and choice of the indigenous populations." The Declaration agreed "to further and assist in the establishment of indigenous Governments and administrations in Syria and Mesopotamia which have already been liberated by the Allies, as well as in those territories which they are engaged in securing and recognising these as soon as they are actually established." Your argument rests on the assumption that Zionism had the legal support required to disenfranchise an entire people, a native population, and transfer sovereignty rights over to newly-arrived European immigrants of Jewish descent. This is patently ridiculous as can easily be surmised by the above documentation. Self-determination for the Arab populations of the Near and Middle East were secured in legal documentation; the "Jewish National Home" was suggested in personal correspondence. "The contradiction between the letters of the Covenant [of the League of Nations] and the policy of the Allies is even more flagrant in the case of the 'independent nation' of Palestine than in that of the 'independent nation' of Syria. For in Palestine we do not propose to even go through the form of consulting the wishes of the present inhabitants of the country though the American Commission is going through the form of asking what they are. Clearly, those who favor colonialism, racial supremacy, and ethnic cleansing can stand over there with Balfour, Jabotinsky, and Shattuck. I'll be over here with the supporters of self-determination, equality, and human rights such as Albert Einstein, Martin Buber, and Hannah Arendt. The Commission, in hopes of finding the most equitable and moral solution to the Near Eastern power vacuum, found that securing egalitarian self-determination for the native populations of what it regarded as "Greater Syria" (namely, Syria, Israel, Jordan, the West Bank and Gaza in today's terms) was of utmost importance and based its recommendations with that in mind. With specific regards to the Zionist enterprise, already well underway, the report candidly emphasized that the only possible way to establish a Jewish state – a colonial entity reliant on enforcing a political ideology of ethnic supremacy and cultural dominance – would be through violent and military means. As a result, the Commission dismissed the moral and peaceful viability of a Jewish state, stating clearly what everyone knows: that the Zionist project demanded and anticipated "a practically complete dispossession of the present non-Jewish inhabitants to Palestine". To be clear, the Commission found nothing problematic with continued, or even increased, legal Jewish immigration to Palestine (as part of "Greater Syria") as long as the new immigrants would regard themselves as equal citizens living alongside the native population. Still, to avoid all misunderstanding, it warned that "the erection of such a Jewish State" could never "be accomplished without the gravest trespass upon the civil and religious rights of existing non-Jewish communities in Palestine." The European colonial powers heeded none of the warnings, recommendations, or desires of the indigenous populations it hoped to rule. Consequently, British Prime Minister David Lloyd George – who later, in 1936, referred to Adolph Hitler as "the greatest living German" - and French Prime Minister Georges Clemenceau, drafted the provisions of the San Remo Resolution and the Treaty of Sèvres, enabling Britain to seize mandated control over Palestine and Iraq, while "giving" Syria to France (which had already ruled Lebanon since 1918). The findings of the King-Crane Commission were deliberately suppressed and kept from the public after its completion. In 1922, the United States Congress passed a joint resolution supporting the establishment of a "Jewish National Home" in Palestine, echoing the sentiment of the Balfour Declaration. Two months later, the Commission report was released. At the time, Edward Mandell House, President Wilson's aid, in a letter that predicted the result of the pending implementation of the suggestions of the Balfour Declaration, wrote: "It is all bad and I told Balfour so. They [the British] are making [the Middle East] a breeding place for future war." "What I have never been able to understand is how [the Balfour Declaration] can be harmonized with the [Anglo-French] declaration, the Covenant [of the League of Nations], or the instruction to the [King-Crane] Commission of Enquiry." It should also be noted that, even though you claim the Balfour Declaration gave full settlement rights to Jewish immigrants in all of Cisjordan (Palestine) and Transjordan (modern day Jordan), you are wrong. The area East of the Jordan River had long been included in the area promised to Sharif Hussein as early as 1915. Whereas Palestine and Transjordan remained a single administrative unit under British control until 1946, this was a matter of administrative convenience for the Mandate and in no way indicated any recognition of Zionist claims to the East Bank of the Jordan. In 1922, Transjordan became an autonomous political entity, formalized by an new clause added to the governing charter of the Mandate of Palestine. It subsequently became independent in 1928. Therefore, Jack, your assertion that it would be "absurd to imagine that this phrase could be used to indicate that only a part of Palestine was reserved for the future Jewish National Home" is wholly contrary to the British government's own determination. The White Paper also states that "the status of all citizens of Palestine in the eyes of the law shall be Palestinian, and it has never been intended that they, or any section of them, should possess any other juridical status." [emphasis mine] As such, when you claim that the state of Israel "inherited the sovereign rights of the Jewish people over Palestine," you are, quite simply, lying. Using these arguments not only undermines your own ethnocentric motivation, but also reveals your supporting materials to be insufficient at best and totally disingenuous at worst. Amazingly, you also attempt to use the Anglo-American Convention in defense of Zionist expansionism and land theft. Ratified by the US Senate and approved by President Calvin Coolidge, the Convention, you say, reaffirmed American support for the stipulations of the Mandate and encouraged Jewish colonization of Palestinian land. Again, you fail to provide any sort of context for your documentation. The Convention was approved the year following the passing of the Immigration Act of 1924 which placed severe limitations on foreign immigration to America and established quotas based on national and ethnic origin. Widely regarded as legislation put forth due to the growing nativism, xenophobia, and anti-semitism in the US at the time, the Act was vehemently opposed by most American Jews. Do you not find it curious that the same administration that attempted to resist the increasing Jewish immigration to this country was more than happy to support immigration to a land it had absolutely no control over, half-way across the world? Your consistent use of citing racist legislation for your own propagandistic purposes is quite unimpressive. Israel remains an unjust and expansionist remnant of aggressive colonialism in a largely post-colonial modern world. It is people like you, Mr. Shattuck, that stymie any advancement toward justice and actively seek to thwart the promotion of human rights and equality for all people. You spread lies and falsified historical references in order to proliferate disinformation and deflect reasonable criticism of the Zionist project and its horrific consequences. Unfortunately for you and people like you, there are facts to back up the most basic truths in this world. And those facts will never be in your favor. Hmm, I guess I did wind up dissecting your awful justifications. Go figure. The question is whether Israeli or Jewish settllements are legal in Palestine, especially the West Bank. The documents you discuss, Sykes-Picot, the British Whitepaper of 1922, the letters of Curzon and Balfour, the internal memos of the British government, the reports of the US McCann commision, are not international law. Although Britain and France probably considered Sykes-Picot to be a solemn, binding agreement, no other nation recognized it. The Balfour Declaration is likewise not international law. The 'San Remo Convention of 1920' and the 'Palestine Mandate' are international law. And they were recognized by the 52 nations of the League of Nations, plus the US. 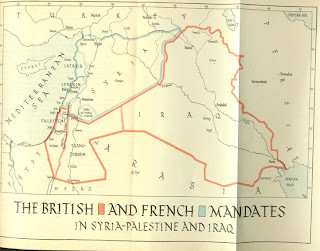 The Anglo-French Declaration of 1918, like Sykes-Picot, was overridden by those same two governments. And since the Declaration had not made any obligations to any third parties, they had the right to abrogate the agreement. Your discussion of racism, white people, colonialism and so on is very interesting, but does not change international law. When people lose arguments over international law they change the subject to a question of justice, or perhaps write off international law as irrelevant, unfair, unenforced. This is what you have done. Issues of justice are valid, of course. And international law itself is mostly the rules agreed to by the winners of wars. But none of this changes the fact that the Jewish settlements under discussion are legal under international law. This particular article was written primarily to refute the tired argument that, somehow, Jewish immigrants (mainly from Europe) had/have a legal right - under international law - to displace, dispossess, and disenfranchise the indigenous inhabitants of Palestine. It does just that. International law is crystal clear in this respect, even if one chooses to believe that foreign, colonial entities can decide what's best for native populations in their own land. As the San Remo Convention notes, and as I myself include in the above article, any Jewish immigration and settlement in Palestine "would not involve the surrender of the rights hitherto enjoyed by the non-Jewish communities in Palestine." Ethnic cleansing, land, water, and property theft, martial law, and an apartheid legal system hardly lives up to the San Remo declaration. Furthermore, your perspective regarding the legitimacy of the obviously illegal Jewish colonies in the West Bank betrays your attempt at pragmatic, clinical discussion. You've already had a similar discussion regarding this issue with Haber, over at The Magnes Zionist, and so I don't feel the need to venture down the same path. You claim that "When people lose arguments over international law they change the subject to a question of justice, or perhaps write off international law as irrelevant, unfair, unenforced. This is what you have done." I have done no such thing. Quite the contrary: I have shown how international law - even when drafted and accepted by 'the winners of wars' - actually supports the right of indigenous populations to self-determination and does not presume to elevate the rights of European Jews over those of Palestinians as you wish it would and pretend it does. Superb! Chewed up and spit out.